(Umbrian)Wine, (Umbrian)Wine and more (Umbrian)Wine Please! Whoever said that moving was one of the most stressful things you can do in your life was so right! Anyone else who has been through the same thing recently will forgive me instantly for not writing for months! Even writing this has taken something like 2 weeks because I’m trying to catch up with 101 other things now that we have internet in the house – finally! Ok, moan over – probably! 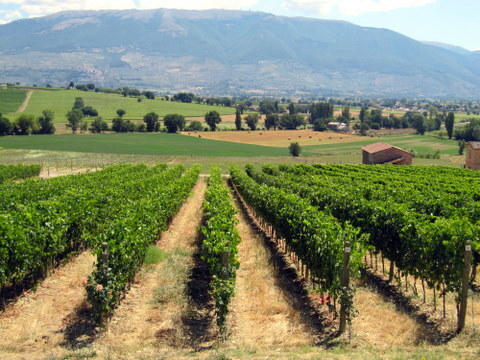 Lets talk about wine – I think we need to introduce everyone to the delights of Cantina Tabarrini – I’ve probably mentioned them before, but they are, to our mind and taste, one of the best, most innovative, local producers Umbria, or even Italy, has to offer. The wine-maker is the owner – Giampaolo, he, together with his lovely wife Federica form a terrific team. A lot of the cantine tend to stick with tradition and, don’t get me wrong, make fabulous wine -however, Giampaolo breaks with tradition and innovates, with amazing results. Think of any wine related question or idea and Giampaolo has thought of it years before and either discounted it or incorporated it in his wine-making! He is one of the few wine makers here in Umbria who make a Rosè – Boca di Rosa – from 100% Sagrantino grapes, with spectacular results. The other day Mark hosted a visit to Tabarrini with Jody Ness from Wine Portfolio – a TV programme that goes out world-wide on World CNBC. Jody is a sommelier and a restaurateur and he found it difficult to categorise this wine – it’s powerful ; on the bottle the strength is put at 15% but really it’s 16.2 %! The surprise is that it’s dry and fruity, looks like a Rosè, has a bouquet of a white, yet tastes like a red. The aftermath of a tasting at Tabarrini! Jody said that as a restaurateur he habitually tries to pair the wines he tastes with a dish – with this Rosè he couldn’t, because it would go with anything! Fish, cheeses, meats or even dessert. A wine that could take you through a whole meal. 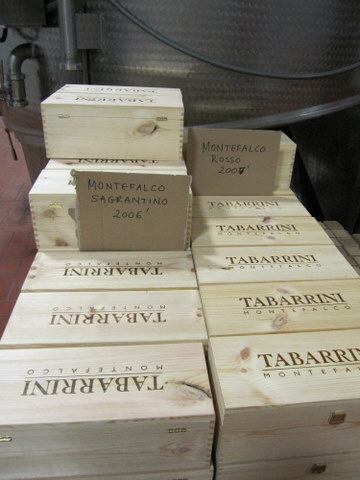 Tabbarini also make Sagrantino, well, actually they make THREE – make that FOUR if you include the dessert wine – Sagrantino Passito – I’ll pass to Mark to fill in the info on these! Colle Grimaldesco – The so called entry level Sagrantino – still enough to make you grin when you’re handed a glass tho and only released after four years of being refined in French barriques and in the bottle! Campo alla Cerqua – The most approachable of the trio, produced from a single vineyard with lighter, looser soil than the others, this has great balance and well controlled tannins as this wine is aged only in large French oak barrels for four years. It has a very limited production of less than 2000 bottles a year. Colle alle Macchie – – This is the big boy – not one for the faint-hearted, with a spectacular bouquet and endless finish. 25 -30 months in French Oak. Then around 3 years refinement in the bottle. You won’t see this one until a minimum of 6 years after harvest! Colle Grimaldesco Passito – Love this! Smooth and totally moreish! I take a great deal of pleasure from seeing the grapes drying on the special racks in lofts exposed to the elements to allow fresh air to circulate around the grapes for a natural desiccating process. 90 days of this, and you don’t have much juice left, but what is there is the nectar of the gods! Plus, and I’m sure Giampaolo won’t mind me blowing his trumpet – Robert Parker has reviewed Tabarrini’s Sagrantino family and they all got over 90 points – Campo alla Cerqua & Colle alle Macchie were both awarded 93 points! Way to go Giampaolo! The star of the show - Giampaolo Tabarrini! Can’t wait to try some of Giampaolo’s wines! Great to have you back blogging again! Un abbraccio! We’ll see what we can do on the 22nd, eh?!! You’ll love Giampaolo – he’s a great guy! News just in … Red wine starts off GREEN!